Phone Amego (1.4c5 or later) includes support for Snom IP phones. You can get on-screen Caller ID, call logging, dial calls, answer, end call, and send touch-tones. 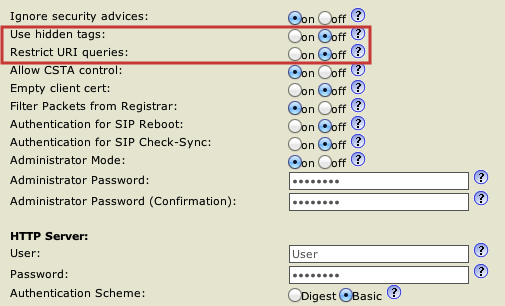 To enable it, you will need to configure your Snom IP phone as described below. repeatedly until you reach "Information IP Address" then press Enter (check). The default username and password may be "admin", "admin" (or none required). factory default settings (no password required). 3. Navigate to "Setup -> Action URL Settings"
scroll down to the bottom of the page and press "Apply" . It may take a few moments for your phone to update its settings. may need to unplug it temporarily to send an "Off-hook" event when you lift the handset. In order for Phone Amego to dial your phone, you will need to configure your phone to allow remote control. Since you are enabling remote control, it is recommended that you establish a username and password to restrict access to your phone. You can set these by navigating to "Setup -> Advanced -> QoS/Security -> HTTP Server". To enable remote control, navigate to "Setup -> Advanced -> QoS/Security"
Scroll down to press "Apply", and then "Save" your settings if requested to do so. Navigate to "Advanced -> Webserver connection type" and set it to "http or https”. When you are ready to place a call, select your Snom IP phone as the telephone device and dial normally using Phone Amego. You may be prompted for your login password the first time you try to dial if needed. You can also set your password explicitly by double-clicking on the corresponding entry in the Telephone Devices table. See Dialing to enable the "Dial With Phone Amego" application service if desired. The configuration procedure above depends on your Snom phone being able to find Phone Amego at a known IP address. Please see IP Addresses and DHCP for additional information. Your primary means of controlling remote access to your phone is the username and password you configure for the HTTP server. Phone Amego uses a WebKit window which supports basic authentication so your username and password are not sent as clear text. Which Snom Phones Are Supported? Phone Amego is designed to work with the Snom 300 or later models that can run firmware version 7 or 8. I tested Phone Amego with an Snom300 I was able to find inexpensively on eBay. I updated the firmware to version 7 and then version 8 (snom300-SIP 8.4.35). 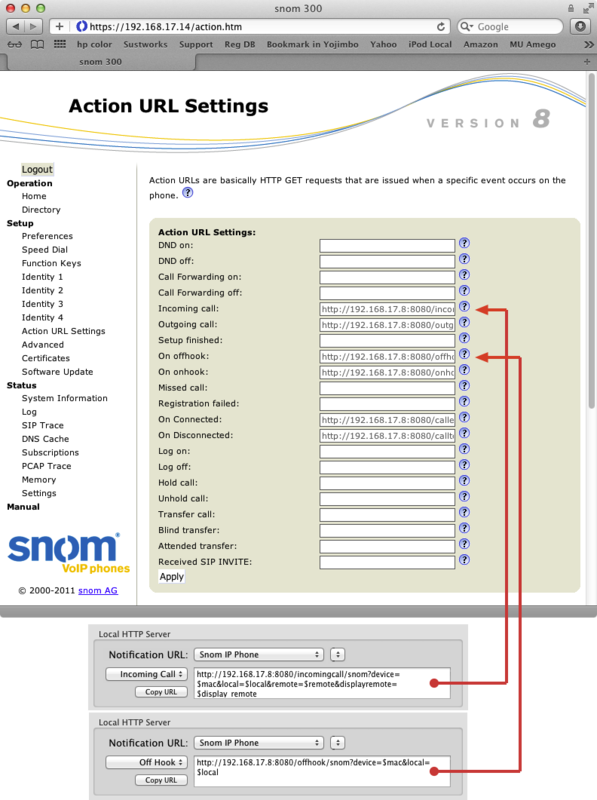 Updating the firmware was easy and the documentation on the Snom web site is extensive. Phone Amego uses features that require firmware version 7 or later (to answer, hangup, and send touch-tones). The Snom300 is a moderately priced entry level IP phone with a 2x16 character display. The user interface is simple but effective for basic configuration. A key feature is that the phone supports standard uaCSTA (user agent Computer Supported Telephony Applications) making it attractive for call center applications. Snom has been a leader in open standards SIP technology in Europe. Solid hardware and software. Extensive Web UI and CTI support allowing you to access almost every feature of the phone. The 2x16 non-backlit display is too limiting to review your call history or access other user features. The features are available through a web UI, but the phone itself offers minimal visual support. One user reported problems getting his snom821 to work with Phone Amego when running firmware version 8.4.35 . Downgrading to snom 821 V8.7.3.19 allowed it to work as expected. If you are unable to find the "Restrict URI queries" setting as shown, this may be a firmware issue.